Installing Command Line Tool for Red Hat OpenShift PaaS on OSX requires few steps on OSX latest version. Here is a short guide for the fully new users. For simple installation, like that of WordPress, one can easily follow the guide using the Graphical User Interface to install WordPress on Red Hat OpenShift. This is for a bit advanced but new users who needs to upload own application or want revision or want to use the OpenShift Client tools known as rhc in some way. The guide shows only installing the tool. It does not show how to create or manage anything on OpenShift. Installing Command Line Tool for Red Hat OpenShift PaaS on OSX has very little requirements like we pointed in our guide on Installing AppFog PaaS Command Line Tool on OS X 10.8.x. Definitely you can use OSX ‘s default Terminal instead of iTerm2. You need to have Ruby and RubyGems installed with administrative privilege. 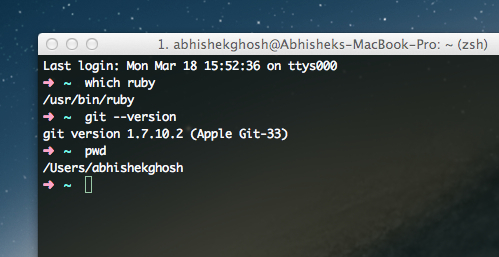 We used homebrew to install Ruby, that part has been shown before along with setup of iTerm2. There is absolutely no meaning of asking why we have used iTerm2 and oh-my-zsh / ZSH instead of Bash and Terminal for Installing Command Line Tool for Red Hat OpenShift. You can use whatever software you want. The commands will remain the same. And a very short video guide for you to assist. We have not shown how to manage multiple SSH keys, we have just accepted with yes command to save the key with defaults. This Article Has Been Shared 379 Times! AppFog Cloud PaaS is quite popular both for free quota to host websites and applications as well as the flexible platform they delivers at an affordable price. Installing SugarCRM on Rackspace Cloud Sites has been described in this step by step guide so that anyone can easily follow the guide and install easily. Cite this article as: Abhishek Ghosh, "Installing Command Line Tool for Red Hat OpenShift PaaS on OSX," in The Customize Windows, March 18, 2013, April 19, 2019, https://thecustomizewindows.com/2013/03/installing-command-line-tool-for-red-hat-openshift-paas-on-osx/.